Gift of life: Pamela Hayes on adopting out her son: “I always thought about him and prayed for him all that time and wondered how he was and what he looked like”. PAMELA Hayes felt overwhelmed with love when she held her first son tightly in her arms and wondered if being in Heaven felt the same way. The first-time mum, aged 25, wasn’t expecting this amount of love, and as she looked down at her child, she questioned her decision to give him up for adoption. Pam’s pregnancy in 1976 was unexpected, her baby the fruit of a “rocky” relationship. “I met Jamie’s father when I was 17, and we dated on and off for most of that year,” Pam said. After a two-year travelling stint in London, the New Zealand native moved back to her home in Lower Hutt, 10km inland from the country’s capital Wellington, and continued working for an insurance company. Pam’s ex-boyfriend came back into her life, pursuing her until she foolishly said “yes” to be his partner to a ball. Two years into the relationship, Pam found out she was pregnant. “I remember very clearly ringing him up to tell him – it was a Friday night – and he said to me, ‘I can’t come round tonight, I’ll see you later on’,” Pam said. “He didn’t come and I have never spoken to him since. Solace and courage came from inside St Mary of the Angels Church, Wellington. “I loved the Church and I knew my relationship with my boyfriend wasn’t right and I knew I should have ceased the relationship,” Pam said. One day after work, soon after I knew I was expecting my baby, I went to St Mary of the Angels Church. I did not know if Mass was on; I just went in and knelt down and gave my life to God. I said: “Help, Lord, I really want you to take over my life”. “I think that prayer was probably the greatest prayer I had said to date because it came from deep within my heart and I believe that God answered my prayer right from that moment. Pam decided not to have the baby in Wellington, but booked an airline ticket to Perth with an initial plan in mind to stay with a friend from Perth whom she had met while she lived in London a few years previously. Pam also planned to break the trip to Perth by staying for four days in Sydney with a young family she had also met and become close to in England and Israel and who had recently returned to their Sydney home. Three months pregnant and completely overwhelmed by a fear of the unknown and a deep-seated fear of flying, Pam stepped onto the Air New Zealand DC8 plane in Wellington for the flight to Sydney. She was seated in between two young men. Pam remembers being upset, very nervous and weeping and “turning to the guy beside me and apologising because I didn’t like flying”. “He was very nice and started to talk to me. “He chatted with me all the way to Sydney, and took my mind right off the flight. “I didn’t worry about it at all after that. It was like my Guardian Angel was sitting there. “He said he lived in Sydney and was returning to Sydney after attending a cousin’s wedding in New Zealand. Towards the end of the night, Pam told him that “I had given my life to the Lord; I was expecting a baby and that my reason for the trip to Perth was to continue my pregnancy”. Despite an offer from her new friend to stay in Sydney with one of his friends, Pam felt certain she was meant to be in Perth. 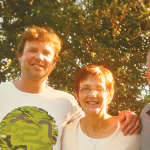 In Perth, Pam stayed with a friend and then began voluntary work at a men’s shelter for the St Vincent de Paul Society. She soon found a share house with a Catholic woman and stayed with her until she gave birth to her baby. In the months leading up to the birth, she became involved in the Charismatic Renewal and she loved attending the prayer meetings most Friday evenings. At one of these meetings she met a Christian Brother who was presenting Life in the Spirit seminars. “I continued to go to Mass and any prayer meetings that were on, and the baby continued to grow inside me,” Pam said. A couple of hours after a Friday-evening prayer meeting, Pam went into labour and 17 hours later gave birth to her son. “It was a very difficult labour for me being alone and not knowing how long it would take,” Pam said. Her son was born on November 8, 1976, about 7pm. Pam was given six weeks to decide if she would keep her son or adopt him out. A Christian friend counselled her and helped Pam make what she said was “a heart-wrenching” decision. “I decided to adopt my baby boy out and signed the papers,” Pam said. 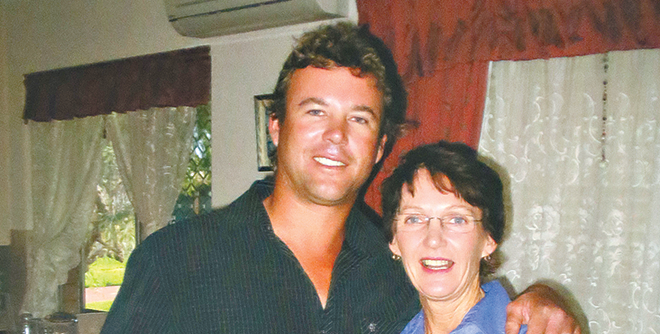 Pam stayed in Perth for another month before flying back to Australia’s east coast, where she visited the young man who had travelled with her on the plane from Wellington to Sydney. The pair had stayed in touch throughout the pregnancy, a romance slowly blossoming with Michael offering gentle support. Three years later, in 1980, Michael and Pam married. Between 1981 and 1996 Pam and Michael had six children, four girls and two boys but Pam never forgot about Jamie. “I always thought about him and prayed for him all that time and wondered what had happened and what he looked like,” Pam said. Pam and Michael prayed for the right time to tell their own children about their half-brother, and also as to when to begin to find her long-lost son. The right time came when their eldest daughter, Angela, was about to be married. “I said ‘none of my children are going to leave their home without hearing about their half-brother, Jamie’,” she said. The family was advised that they were having a dinner and a “round-table talk” meeting afterwards. Having all the family together for a meal was not unusual but the “round table talk” was always met with more interest because it was the sort of occasion that only occurred if Pam and Michael were announcing another baby. After dinner they gathered in the lounge room and I told them the story of their half-brother, Jamie. Michael and Pam then decided that she should begin the process of trying to get in touch with Jamie. “Up until this time, I had been reluctant to begin this process to get in touch with him for one reason or another,” she said. Jamie was 30 before Pam laid eyes on him in February 2009. To Pam’s surprise, the search was easier than expected, as Jamie had already been looking for his birth mother years earlier. Once Pam had talked to the social worker, she was able to contact Jamie and let him know that his birth mother was looking for him. Jamie phoned Pam and explained he was getting married to Jasmine on December 8, 2006 and said he would contact her when he came back from his honeymoon. “I sent Jamie our family Christmas letter and some photos. He sent me a photo from his wedding and I knew straight away he was my child, as he looked so much like his father,” she said. “So after that we just started texting, phoning and writing – he wanted to take it slowly. “One of the first things he said to me was, ‘Thank you for having me, and don’t feel bad about the fact that you adopted me because I was brought up by lovely parents’. 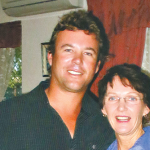 Three years later, in 2009, Pam and Michael visited Perth to meet Jamie outside the same apartment where a younger Pam lived 30 years before. “I was nervous, so Jamie would have been really nervous,” Pam said. “So Jamie arrived in his car outside, I came out, but once we looked at each other and Jamie gave me a hug, you know, it was like all those years just didn’t seem to be there. Pam and Michael met Jamie’s wife Jasmine and Jamie’s parents over lunch while in Perth and caught up on the lost years. Also at the lunch was Wendy, one of Pam’s friends at the time of Jamie’s birth who said to Jamie that “she had known him all his life”. “We eventually came home, and I had this extreme love for him at the time. It was just a real deep love that lasted for about two months,” Pam said. “It was probably that love of connection that I missed when I gave birth to him. 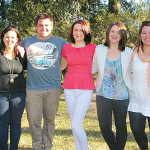 Jamie and his wife Jasmine flew east to visit Pam and his six half-brothers and sisters in 2012, and has since met his biological father. Pam said she never regretted giving birth to Jamie or putting him up for adoption. 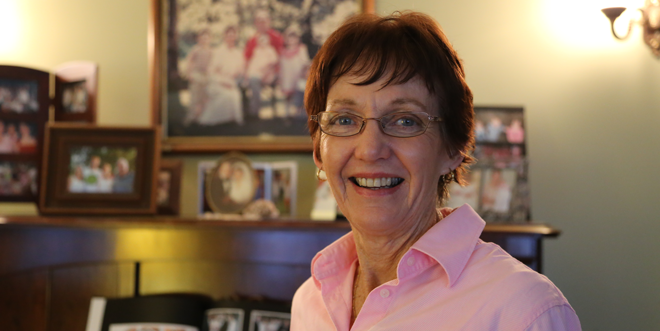 “I’ve always been pro-life,” Pam said. “When a woman becomes pregnant I can understand, why, when they have no support and they are in such a frightened state that they could easily decide to have an abortion. “I am sure that, if women with an unplanned pregnancy, avail themselves of the many counselling services available to assist them through those first few weeks, many of them considering abortion would change their mind, once they experienced some significant personal support. “When I was pregnant, I thought – ‘I’m going to Perth, who’s going to help me, what am I going to do, what hospital, what doctor? Pam’s faith in God and her husband Michael, somewhat of a St Joseph figure to her, have pulled her through the toughest times in her life. “From the time I gave my life over to the Lord Jesus Christ, in that church in Wellington, I don’t think I’ve ever waivered in my faith. I suppose because I knew that God would be with me, that was it,” Pam said. 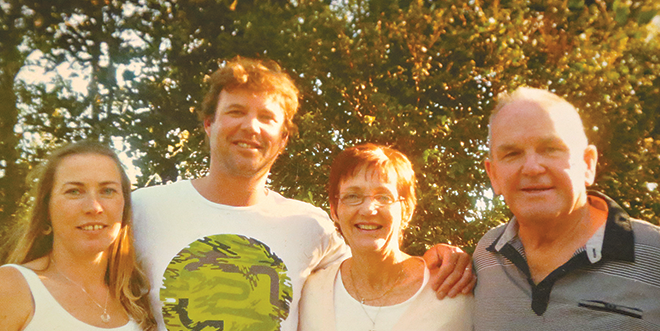 Pam and Michael visited Jamie and his wife Jasmine in Western Australia earlier this month. “This time when I went over, I had no anxiety or worries, I just really felt like Jamie was just another one of my children,” Pam said. United family: Jasmine and Jamie Stewart are happy having Jamie’s biological mum Pamela Hayes and her husband Michael Hayes in their lives. First meeting: (Inset above) Pamela Hayes meets her son Jamie Stewart, from Perth, in 2009, for the first time since adopting him out in 1976. 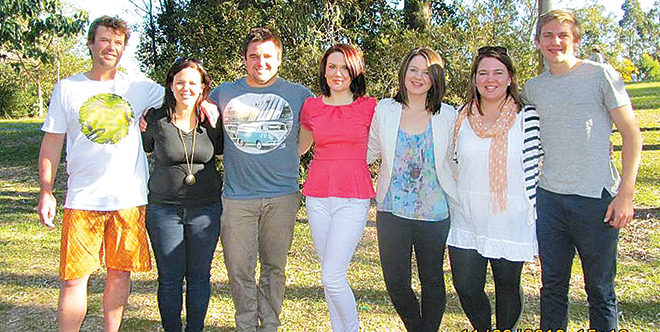 Family ties: (Right) Jamie Stewart (left) meeting his half-brothers and sisters Angela Harris, Paul Hayes, Joanna Hayes, Veronica Hayes, Rosemary Grear and Tim Hayes, in 2012.